If you’re looking for a high quality stainless steel cookware set, Amazon has a really great price on the Cuisinart 12 pc. stainless steel set. 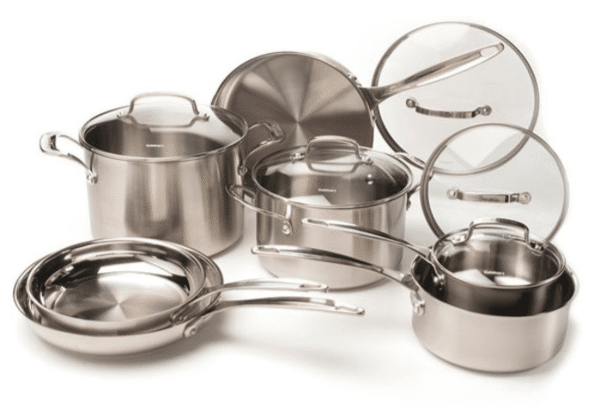 This set, made with high quality 18/10 stainless steel, is going for just $129.99! This deal is good today only as Amazon’s Deal of the Day. I prefer stainless steel as my primary cooking set. I try to use cast iron sparingly as it leaches iron into foods which can cause too high of levels, especially in men and children. This is a really good price for a quality set, so if you’ve been waiting for a deal, check this set out here.